It’s easy to see why travelers prefer Haneda over Narita Airport, which is 60 miles from the capital. Compare a 15-minute monorail ride (at 500 yen/$5) to Haneda with a 90-minute commute on the Narita Express that requires changing trains, with luggage in tow. A taxi ride to Narita will set you back about $200, one way. Competition for coveted daytime slots at the airport is furious, however, with carriers from 17 countries angling for position. 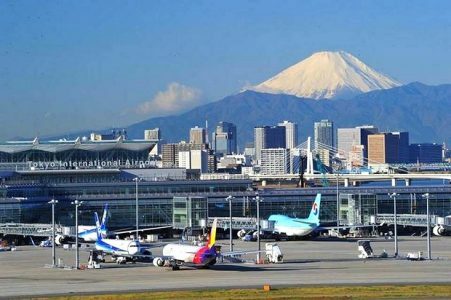 Delta Air Lines came out the winner earlier this year when the DOT announced it would be the only U.S. airline granted two daytime flights to Haneda. American, United and Hawaiian Air each have one. Delta started its new non-stops from Minneapolis-St. Paul this weekend and shifted its Los Angeles-Tokyo flights from Narita to Haneda. Earlier this month, the airline dropped its New York JFK-Narita route, but still flies to Narita from Seattle, Portland, Detroit and Atlanta. Japan-based ANA, meanwhile, has shifted its New York JFK and Chicago O’Hare routes from Tokyo Narita to Haneda. United flies to Haneda from San Francisco, while Hawaiian Airlines serves Honolulu. (Conde Nast Traveler, Travel Skills).